If “The Divine Embrace” was to be summarized in one sentence, it would be: “… spiritual life…is union with God fulfilled in a life of contemplation and participation in God’s vision for life in this world” (p. 16). Dr. Webber goes back to this statement over and over as he explores spirituality in both the early and present church. This statement is infused with power with another one that appears over and over: “He stretched out His arms of love on the hard wood of the cross” (p. 125), explaining that it is in the incarnation, death and resurrection that we see renewal and new life of not just the individual, but all of creation. This, says Webber, is God’s vision: the recapitulation of the heavens and the earth; this is the vision that we are to participate in as we enjoy the divine embrace providing for us an authentic Christian spirituality. It is clear that Dr. Webber feels that the contemporary church is lacking in a proper understanding of the spiritual life. He emphasizes the “proper” display of the Christian spiritual life as he presents the practice of the early church supported by the writings of the church fathers on the way to his plea to restore the ancient view of spirituality in the modern church. Traveling on this journey from the foundations of the Church to today, Webber shows how the various ages of the church contributed to its losing the authentic practice of the spiritual life he describes. Webber spends much time elaborating on the Catholic and Orthodox practices that grew out of the early church as an aid to rediscovering this authentic spirituality. These include the Rules of St. Benedict, the spiritual disciplines, the Lectio Divina, to name a few. He also presents a heightened view of baptism that leaves no doubt to the reader that he is convinced that this is a sacred and essential rite which the modern church has neglect to its peril. As Dr. Webber discussed the ancient tools and rites of the faith and their appeal to the younger generation of today I was at first concerned that this was going to be a book supporting the Emergent Church movement with the accompanying criticism of the Church, but as I progressed through the book his love for, and commitment to, the Church grew more evident. The final chapters solidify Webbers view that it is, in fact, through the Church and its corporate worship (when done properly) that an individual is able to fully find the “Divine Embrace” or authentic Christian Spirituality. One of the strengths of this book is Webbers extensive knowledge of the early Church, the Church Fathers and the Church throughout history which he presents as appropriate throughout the book. He does not limit his citations to just one or two primary sources, but draws from the vast expanse of the fathers and patriarchs as he unfolds his view of the spiritual life. Another strength that comes through is Webbers deep background in worship (this is where I was first introduced to his work). He uses his knowledge and understanding of worship to clearly explain how modern worship services can be improved to be a better conduit for aiding in the worshiper’s growth in the authentic spiritual life which the book is presenting. A weakness of the book, I believe, is Webber’s limited dealing with faith traditions other than his own. Undoubtedly, a man of his background would be familiar with more than his own tradition, but in most instances, he writes with the presumption that his readers are in complete agreement. I do not fault him for believing the way he does and sticking to it, but a work that was destined to have wide appeal should at least make allowance for other traditions. For example, many of his examples of spirituality that he is proposing, I have seen in the lives of believers who were “entirely sanctified” or “filled with the Holy Spirit” in a way that is beyond his discussion of the Holy Spirit or sanctification. Another weakness that I see in this book is the way Webber seems to downplay the “crisis experiences” in the life of the believer. If one just takes what is in this book, they might believe that a person could just slip into salvation without a moment of decision to receive Christ as their Savior. He suggests that especially in the case of a 2nd or 3rd generation Christian, that the faith of the family often is just passed on to the children without that crisis moment when they realize they are in need of salvation. I would quickly add, however, that the weaknesses noted above are not a great deterrent to my acceptance of the premise of this book. I enjoy Robert Webber’s writing and this book did not disappoint me. While I could see the spiritual life he describes lived out in others only using different terms, he still offers much to consider to help the reader grow deeper in their relationship with God and more satisfied in their spirituality taking part in the divine embrace that Dr. Webber offers. Over the years I have added several of Dr. Webber’s books to my library after first meeting him at a worship conference that he presented. As I researched further after completing this book, I was disappointed to discover that Robert Webber passed away back in 2007. 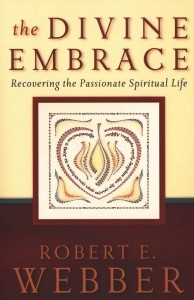 “The Divine Embrace: Recovering the Passionate Spiritual Life” by Robert E. Webber, part of the “Ancient-Future” series, was published in 2006 by Baker Books, a division of Baker Publishing Group in Grand Rapids, Michigan. The International Standard Book Number is 978-0-8010-6555-2.